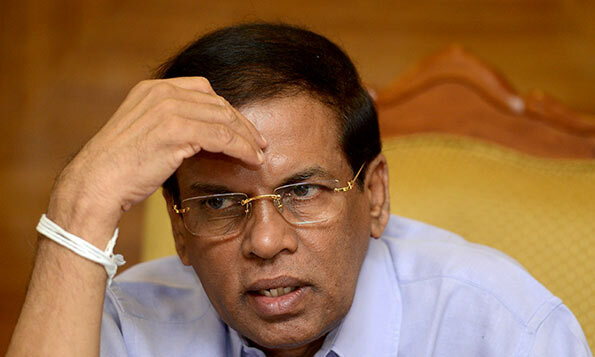 President Maithripla Sirisena expressed apology over the inconvenience caused to the Buddhist monks due to the tear gas attack, when a group of Buddhist monks representing several organizations including Sinhalaye Api National Organization , visited the President’s office to handover a message yesterday (Nov 19). They had not intimated earlier that they would come to handover a message to the President. However, the President instructed to take immediate action to conduct an inquiry on this matter. The President invited the delegation and engaged in a friendly conversation with the Venerable Theros and accepted the letter presented by them over the judiciary matters of Ven. Galagodaatte Gnanasara Thero. Sorry ,Is the most stupid word in British vocabulary . After every wrong act , people say. Sorry . Is he not the Law and Order Minister? Well, he holds ultimate responsibility for Police actions. Do not make any more stupid mistakes. It’s your time now .Resign.